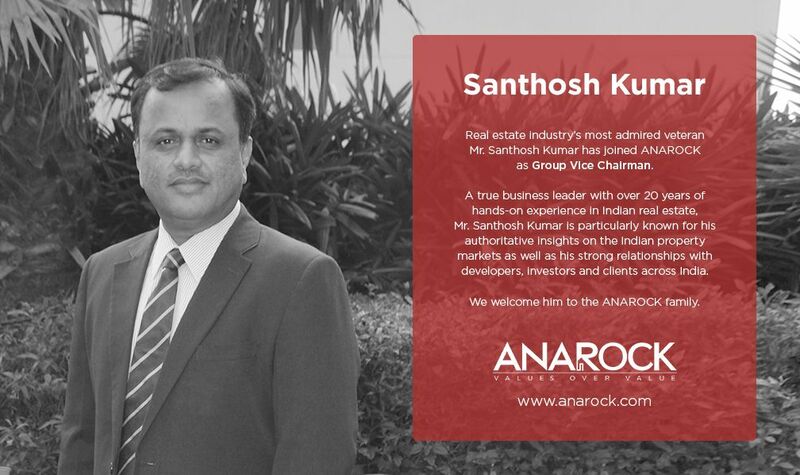 New Delhi, 11 January 2018: Real estate industry veteran, Santhosh Kumar, today joined Anuj Puri’s new age real estate firm ANAROCK Property Consultants as Group Vice-Chairman, after more than a decade with international real estate consultancy JLL India as CEO – Operations. He will be based out of ANAROCK’s Gurgaon office, with ANAROCK’s nine India offices, Dubai office and Finance reporting directly to him. A long-standing associate of Anuj Puri, Santhosh Kumar was closely involved in the merger of Jones Lang LaSalle and Trammell Crow Meghraj (TCM) which created the largest international real estate consultancy in India. As CEO of Operations, he had P&L responsibility of JLL India’s 11 offices, ensuring their seamless business operations and growth. He has over 20 years of hands-on experience in Indian real estate. As ANAROCK’s Group Vice Chairman, Santhosh Kumar hits the ground running and has assumed all operational responsibility for the Firm. Santhosh began his career in 1998 as Finance Manager with Chesterton Meghraj, was elevated to Chief Finance Officer in 2000 and became a member of the Board of Chesterton Meghraj to advise on key strategic planning issues and make recommendations on major business initiatives and financial decisions. From 2002, he managed business operations for property consultants Trammell Crow Meghraj (TCM) in Northern and Eastern India and was elevated to Chief Operating Officer.